All transactions are safe and secure with a reliable history in online purchasing behind each of our associates. Buy the Daria Quinn Costume t-shirt to own Daria clothing and merchandise. Have you ever dreamed of being popular? Quinn Morgendorffer has made that dream a reality and even took it a step further by joining the elite Fashion Club. She might as well have to fight off guys with sticks she is so adored. 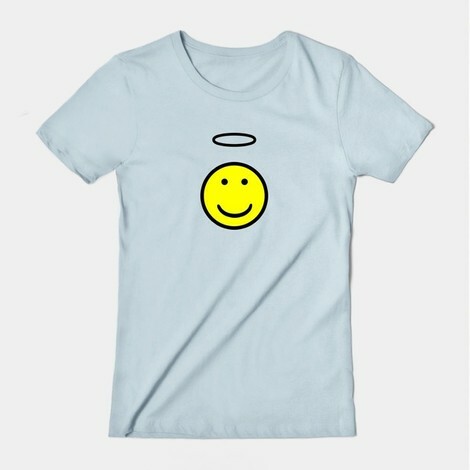 This pink Quinn costume t-shirt featuring a smiley face topped with a halo can be seen throughout the series. Perhaps it will help bring you some popularity as well. Rest assured, this Quinn Morgendorffer smiley shirt is Fashion Club approved! In addition to the Daria Quinn Costume tee above, browse the Daria Clothing Gallery for more apparel like men's and women's clothes, kids shirts or hoodies.